When the schools close for the summer break, the live of those terminating school has already taken another track. Fishing, hunting, construction work and farming are skills that are not learned in school. Those who want to go on with school have to move to the province capital or another larger city. For the people living in the remote forest villages, chances to obtain a higher degree rare poor. Moving to another place poses considerable logistic challenges and often enough, the enrollment in a high school fails because of lack of funding to pay for school fees and lodging. Yet, chances for higher education are not equal, even when logistic and financial obstacles have been removed: families tend to invest in the education of their sons. Dorcas is an exceptional case. Thanks to the combined funding from Bonobo Alive and ‘Children for a better World’, a foundation based in Germany, she and Justin, a boy from the same village, moved to a boarding school in the city of Oshwe, 350 kilometer away from their forest home. For Dorcas and Justin, life away from their families poses a personal challenge. Bonobo Alive hopes that the initiative will raise awareness towards conservation among the school community. 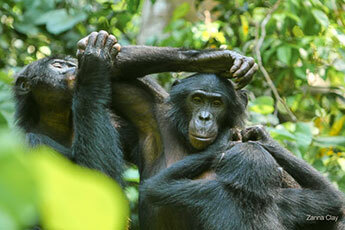 Like other urban places, bonobos and other wildlife has largely disappeared from the forests surrounding Oshwe. The goal to protect bonobos and their natural habitat will only succeed if people realize the economic benefits that ca be gained from conservation. Dorkas and Justin are agents to spread this idea. Since years Bonobo Alive is engaged in the protection of bonobos in the buffer zone of Salonga National Park. Stock numbers obtained along this work indicate that the effort pays off. The permanent presence of researchers and conservationists has contained snaring and hunting, improving the security of the habituated bonobos as well their neighbors. It was always clear to us that the impact of our efforts had its limits. However, how fragile the tediously constructed shield really was, we had to learn a few weeks ago. In February 2018, poachers in the southern part of the study area LuiKotale were up to mischief. Almost two thousand snares were discovered and removed by help of local villagers and our team on ground. 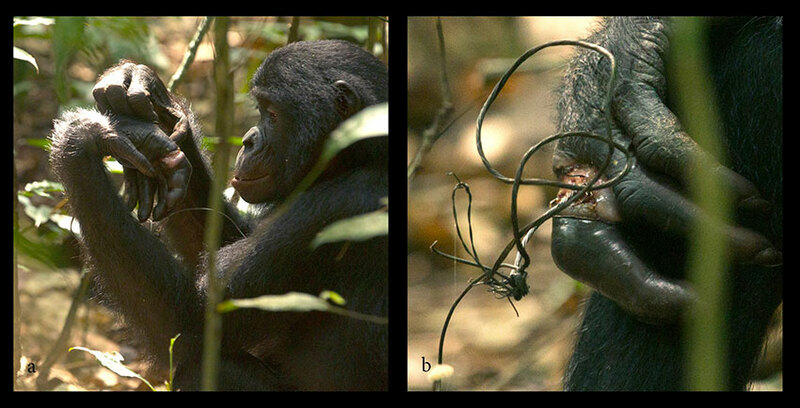 Sadly, Ulrich, a young male of the middle community had already got caught in a snare and struggles with the wire around his hand (Figure 1a&b). Then, armed poachers arrived in the neighborhoods of the study site. Neither snares nor the invasion of poachers are new to us but the intense and targeted killing of bonobos is. In March we received a message that seven bonobos had allegedly been shot in the immediate neighborhood of the study site. 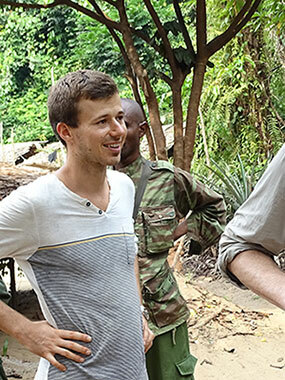 This was a shock – not only for us but also for the local people working for the LuiKotale Bonobo Project. The Congolese wildlife authority (ICCN) was informed immediately and investigates the case but the prospects for success are slim. Even if the hunters were to be arrested and prosecuted the disillusion remains that something similar may happen again at any time. It is no relieve but a glimpse of hope that the people from the two villages working with us became active and are committed clearing up this crime. Their commitment shows how much they identify with the project and its goals. For them, bonobos mean a lot more than just a piece of meat. Let’s hope that their traditional network that ties huge family clans together will spread this attitude. Bonobos attract researchers, conservationists, and film teams, opening up new sources of income for entire villages – but only as long as they are alive. Bonobos and chimpanzees are our closest relatives. What we share are not only the habit of being embedded in complex social systems and the ability to cooperate with kin and non-kin alike, but also the susceptibility to diseases in general and infectious diseases in particular. Humans go and see a doctor and zoo-living apes are cared for by the vet. But what do wild apes when they get sick? Researchers tackling this question tend to look at medicinal plants. This is not surprising as there is profound knowledge about the curative effects of leaves, flowers, barks and roots. While this approach facilitates successful search for appropriate specimens, it is not sufficient to proof any cause and effect. The latter requires - amongst other - knowledge about pharmacological active compounds and their fit with specific symptoms of disease. For the research staff at LuiKotale, scoring health-related parameters of bonobos is part of the daily routine. The expertise for identifying pharmacological properties of wild plants comes from Musuyu Muganza, an approbated pharmacist associated with our project since long. Since 2011 he conducts work combining the traditional knowledge of medicinal plants from our study area with the detection of pharmacologic active compounds and their therapeutic effects. For the last two years, Bonobo Alive e.V. has covered part of the expenses for doing research at Antwerp University. In January 2017, Musuyu submitted his PhD thesis and when he travelled back to Kinshasa, he had a doctoral hat in his luggage. To turn the engagement of Bonobo Alive e.V. into a real success story, one would wish that the work on medicinal plants and their use by animals will be incorporated into the curriculum of Kinshasa University. Research on medicinal plants of our study site in the Cuvette Centrale included systematic collection of specimens (figure 1), their taxonomic identification in the herbarium of the University of Kinshasa (Figure 2), and pharmacological analyses (Figure 3). Current point of culmination is the successful defense of Musuyu Muganza’s (center) dissertation at the University of Antwerp (Figure 4). Female bonobos are attentive and patient mothers who care for their offspring even when full-grown. Parenting into adulthood is only possible when the offspring stays in its natal group, as males tend to do. Females, on the other hand, usually transfer to other groups around puberty, where they weave their own social network. The benefits of close bonds between mother and son are not yet entirely understood, but observations suggest that a mother’s protectiveness can influence competition among males. Thus, maternal support may cause an imbalance of power that puts males without close kin at a disadvantage. Zoe, with her three sons, is an institution of the West-community, and well occupied with maternal duties. Her oldest son Ben reached adulthood a long time ago, and holds a high status within the male cohort. Zed, the middle child, is not yet fully grown, but shows ambitions to use maternal support to promote his individual career. Zizu is Zoe’s youngest son, a privileged child that also benefits from the high rank of his mother and the presence of Ben and Zed. The atmospheric portrait of Zoe taken by Caro Deimel became the label for Bonobo Alive, and is also displayed on the bestselling t-shirt. Now, Zizu has joined his mother: Etta Sophie has designed the print on the new Bonobo Alive t-shirt collection, using a shot taken by the wildlife photographer Christian Ziegler. This way, the t-shirts symbolize the trait that distinguishes bonobos from other Great Apes: mothers and sons stay together. Substantial efforts are made to protect great ape species throughout their range of distribution. However, it is not always clear how effective this investment actually is. Recent studies have tried to assess the impact of conservation activities in quantitative ways and offer a kind of quality control of different types of wildlife conservation. What was found is that the permanent presence of people engaging in the protection of great apes is particularly effective in preventing hunting and other destructive activities, disregarding whether this is done by conservationists or researchers. Based on this it is tempting to argue that the task of protecting wild populations of apes can be achieved by hiring enough staff and install them at as many sites as possible. In reality however, the number of long-term sites in ape habitat is limited. The reason for that is a mix of different things including the costs for running such sites, the difficult conditions for living and working at remote field sites, and the constraints in finding the people who are prepared to spend long periods of time in such areas. An alternative to creating new sites is expanding the range of activity at established ones. Thanks to the support from the Ouwehands Zoo Foundation (OZW) and Quagga, two nature conservation organizations from The Netherlands, as well as the Wuppertal Zoo Society, the Zoo Cologne und the Wilhelma Stuttgart, Bonobo Alive e.V. is now able to expand its conservation activities to a new area of about 100 km2. 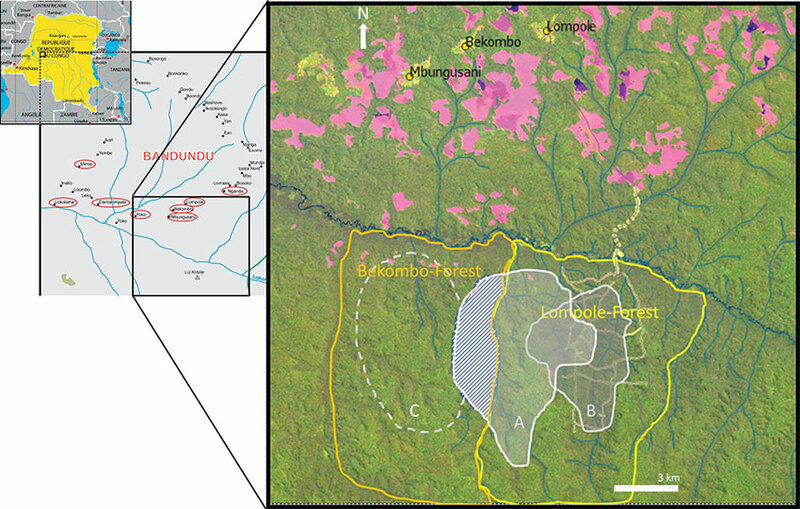 This forest is in close vicinity of the LuiKotale Bonobo Research site (see attached Figure) and covers the range of bonobos not yet under improved protection. With the support from the above mentioned organizations, people from villages that have not yet been employed can be hired for the assessment of the bonobo population in their forest, habituation, biomonitoring, and anti-poaching patrols. Improving the protection status of the new terrain will benefit bonobos and many other endangered species. Bonobo Alive will use this as another opportunity to convince village people how wild animals and humans can equally benefit from conservation activities. When waters rise at the end of the dry season, fishing subsides and the local population covers its need for animal protein focusing on subsistence hunting. Given the low population density, subsistence hunting is sustainable. This is in strong contrast to the organized commercial poaching, involving groups of well-armed people coming from other provinces, furnished with plenty of ammunition. Their focus is on large mammals: elephant, forest buffalo, sitatunga, and bonobo. Although hunting of endangered species is illegal, poaching and bush meat trade is common as law enforcement is rare. In order to put a stop at the professional poacher's game, practical steps such as anti-poaching patrols covering the remote forests are required. Occasionally, large scale anti-poaching initiatives are launched by international conservation organizations but information can travel fast in the forest, rendering raids that involve not only wildlife guards but larger groups of armed soldiers often ineffective. Compared to that, anti-poaching patrols can be more efficient when they focus on small areas and involve people from nearby villages. With some encouragement, it is not difficult to motivate village people as they are all but excited by the invasions of armed poachers into their traditional hunting grounds. Since several years, Bonobo Alive e.V. 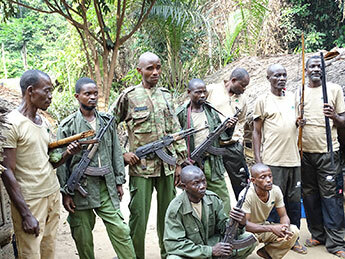 supports anti-poaching patrols of teams consisting of villagers and guards from the Congolese Wildlife Authority, ICCN. Donations to Bonobo Alive e.V. are used to purchase equipment, provisions and remuneration for these patrols. Next to contributions of members and single donations, Bonobo Alive e.V. obtains substantial aid from German Zoos, such as the Zoo Wuppertal, Stuttgart or Cologne. Recently the Zoo of Cologne donated a large number of working clothes for the members of the anti-poaching patrols. Better equipped, these feel not only safer but on one level with the uniformed and armed wildlife guards. Testing the clothes during the last patrol, people were more than satisfied. With this, Bonobo Alive e.V. sets new standards for its initiatives. “The trousers and T-Shirts with the logo of the Cologne Zoo are getting status symbols among the male village communities” says Antonin Leclerque who is currently in charge of organizing the anti-poaching patrols. Without intention, the donation from Cologne Zoo may give an unexpected popularity to the ideas of species protection and nature conservation. The biggest threat to wild bonobos is hunting by humans. To protect the bonobo population of LuiKotale and its surroundings from hunting mixed teams of armed guards from the Congolese Wildlife Authority (ICCN) and villagers conduct anti-poaching patrols. This initiative which is financed exclusively by Bonobo Alive e.V.is aims on detecting hunting camps, identifying hunting on protected species such as bonobos and elephants, and enabling the Congolese Wildlife Authority to take action. Due to the permanent presence of researchers and local staff it is relatively easy to assess the impact of such patrols within the study site of LuiKotale. Evidence suggests that conducting anti-poaching patrols has largely reduced hunting within the study site and that bonobos are now better protected than at times when there were no anti-poaching patrols. However, how effective are the patrols in areas that are further away? How effective are they in protecting bonobos and other endangered species such as forest elephants and buffalos, and – provided there is a detectible effect – do patrols have a lasting impact on hunting and other forms of human encroachment? To answer these and related questions, a monitoring project has been launched to assess the status of bonobos and other wildlife on a larger spatial scale. Using standard techniques for biomonitoring such as transect walks and camera traps to obtain information on the status of rare and nocturnal species. As the two examples attached here show, the camera traps facilitate close range encounters with some rare and enigmatic species. The results can be used to measure the impact of patrols in a quantitative way. 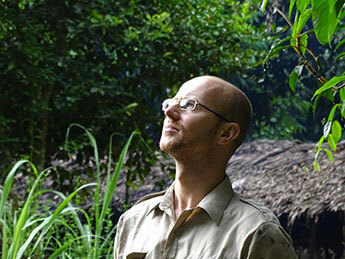 Under the leadership of the Zoologist Joost van Schijndel, a local team will survey an area of about 300 km2 for signs of bonobos and other protected wild life. 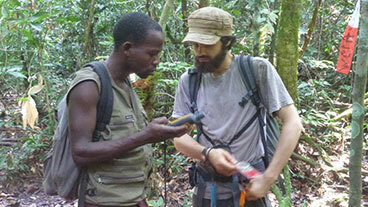 At the same time, the survey will generate specific information on the use of the forest by humans. With the results of the monitoring program, we will help to evaluate the impact of patrols on a spatial scale and to improve the protocol of the initiative. 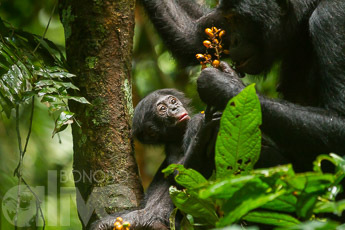 In addition, the data can contribute to plans for protecting bonobos across the southern part of Salonga National Park. 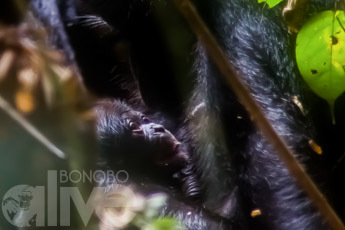 Since several years, Bonobo Alive has made efforts to protect bonobos at the site of LuiKotale and its surroundings, in the Democratic Republic of Congo. Now the targets of protection appear in a large campaign launched by WWF Germany. WWF has ambitious plans to enhance protection of bonobos and other wildlife in Salonga National Park–one of the largest refuges of wild bonobos in DRC. The footage that is used in this campaign features members of the Bompusa community–a group that has been habituated to the presence of researchers and which provides data to an increasing number of research projects. Thanks to the continuous support of Bonobo Alive, the bonobo population at LuiKotale and its surroundings is better protected than in other places in DRC. It is hoped that the WWF campaign will succeed in protecting endangered bonobos throughout DRC, and that the bonobos of LuiKotale will serve as ambassadors of hope and flagship-species for conservation in this international campaign. Female bonobos are caring and attentive mothers and establish close social bonds to their offspring. Sons remain in the natal group and maintain close associations to their mother even as adults. Daughters are different: They transfer to another community before starting to reproduce themselves. However, rules are not without exceptions: In February 2014, the young female Polly gave birth to her first child while still remaining together with her mother Paula and her two sisters Priska and Parvati in the community in which she was born. Polly is the oldest daughter in Paulas clan and with 12 years an exceptionally young mother. No one of the research team at LuiKotale had sensed Polly’s pregnancy and the birth of little Puran, Paula’s grand-daughter, came as a big surprise. The fact that Polly gave birth before emigrating is puzzling. There are multiple other bonobo communities in the forest of LuiKotale and Polly had many opportunities to join one of them. In fact, she had already disappeared for some time but then re-joined the study group. Why did she stay ? Paula is among the top ranking females and Polly may just delay her transfer to another group to enjoy a bit longer the privileges deriving from her mothers’ dominance status. While the puzzle remains to be solved, researchers at LuiKotale have the rare opportunity to study interactions among three generations of the same matriline.